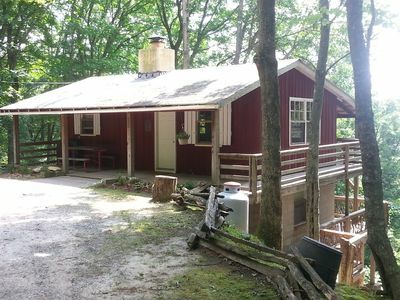 Gather your family and friends and come stay at our Cozy Mountain Lakefront Cabin nestled along the east shoreline of Wolf Lake in Paradise Cove, where peaceful serenity awaits you! 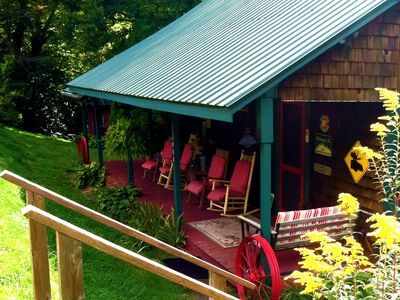 This cozy cabin has approximately 2,600 sq. ft. of living space, with 4 bedrooms and 2 ½ baths. As you drive along the quaint state road that runs along the east side of Wolf Lake, you will be mesmerized by the beauty of the area and the crystal clear water of Wolf Lake on your left. 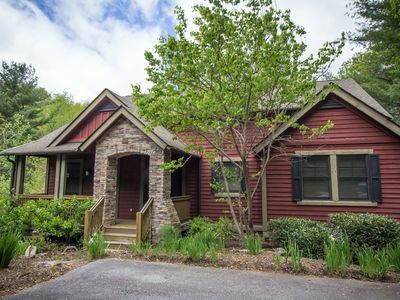 Drive .8 miles and turn right up an asphalt driveway that leads to a beautiful custom built two story cabin, with wrap around decks on the first and second level. 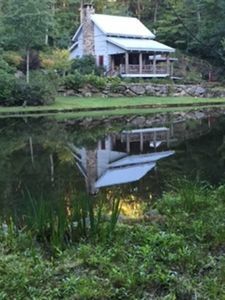 The cabin is cedar sided with stacked Tennessee field stone, and is the shape of a hexagon with beautiful views from every angle! 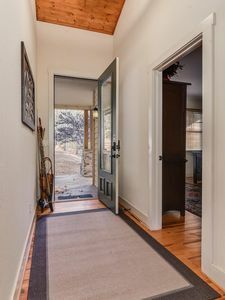 The main entrance leads you inside the first level to an open floor plan which includes a family room, dining room that seats eight, a free standing wood stove and rock hearth, sitting area and kitchen. The pantry, laundry room, and a half bath adjoin the open floor plan. The floors are hardwood and all the rooms on this level have tongue & grooved wood 10’ ceilings with recessed lighting. The family room has a sliding glass door that opens to the rock patio where the picnic tables are located. 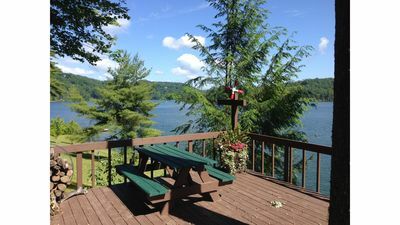 This area is connected by a wrap around deck that overlooks the lake and mountains. 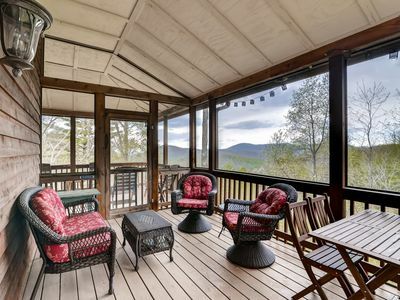 The sitting area on the opposite side of the cabin has a sliding glass door that leads out to a rock patio where you will find a Leisure Bay Spa Hot Tub with seating for 3 people and lounges for 2 more. This area also has a Weber Gas Grill. As you walk up the carpeted stairs to the second level you walk in to a great room that has vaulted ceilings with wooden beams, a beautiful rock fireplace, breathtaking views of the lake and mountains, and two sliding glass doors that lead out to a massive wrap around deck. The walls in this great room are tongue & grooved wood and all the floors on this second level are carpeted. All four bedrooms are located on this upper level. The Master Bedroom has a king size bed, with private bath, and sliding glass door that leads out to a covered porch. 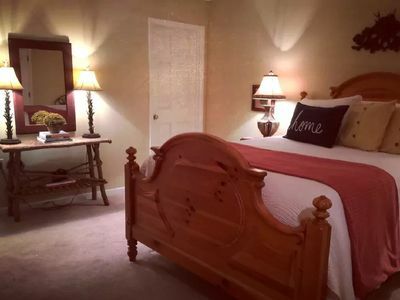 The second bedroom has a queen size bed, third bedroom has a full size bed and twin bed, and fourth bedroom has an extra long twin bed. These three bedrooms share the second bath that has a standard size bath & shower. Now let’s step outside! Take a seat in one of several rocking chairs on the wrap around decks and enjoy the tranquility of this very special place. 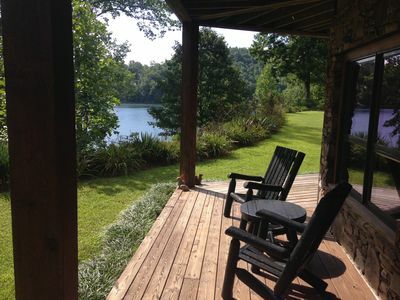 We have a nice level big yard facing the lake with an awesome spot for bonfires! Amazing sunsets and the sky is full of stars that seem like you can just reach up and touch them! Time to head down to the lake! Our cabin is located along the shoreline of Wolf Lake, which is 183 acres of crystal clear emerald water (Blue Jewell) that meanders between the mountains. 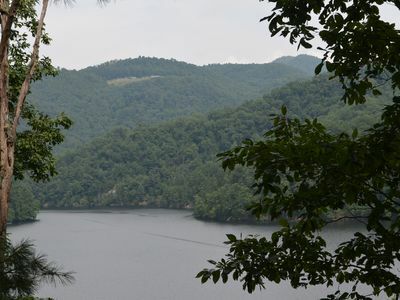 This lake is the headwaters of the East Fork of the Tuckasegee River 3,080 feet above sea level. Forty percent of the shoreline is bordered by National Forest. In the 1950’s a dam was built to control flooding downstream and provide hydroelectric power. Wolf Lake is at the top of a stair-step system of lakes that includes Tanasee, Bear, and Cedar Cliff. The Lake tributaries are Wolf Creek, Charley’s Creek, and Long Branch. Wolf Lake is a great place for all types of water activities. 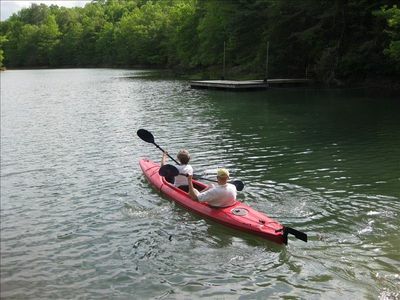 Fishing, pontoon boat cruising, water skiing, inner tube riding, knee boarding, wakeboarding, jet skiing, kayaking, canoeing, and swimming in the refreshing crystal clear therapeutic water! 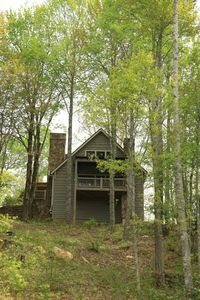 The cabin comes with the use of a private boat dock, swim beach, and shaded picnic area. The boat dock has a 16’ X 16’ platform with ladder, for fishing, swimming, lounging, and boat docking. Our rates include the use of an 18’ Sun Tracker Pontoon Boat for cruising the lake, fishing, or to lounge in. You’re more than welcome to bring your own boats, jet skies, kayaks, and canoes. Across the lake is a NC Wildlife Boat Access Area with loading dock that you can use to launch your boat. 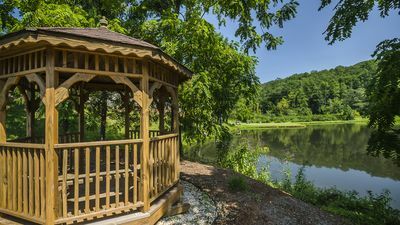 Drive your boat across the lake to our private dock where you can keep the boat during your stay. We even have an area to park your trailers. 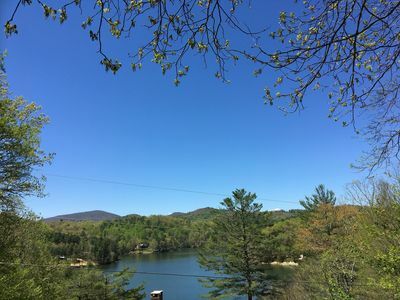 Wolf Lake is located off of Canada Road (Hwy 281) between Lake Toxaway and Tuckasegee, NC. 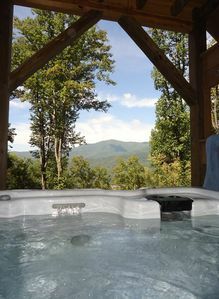 We are eleven miles from the Blue Ridge Parkway where you can view Wolf Lake & Wolf Mountain from Overlook 424.8. 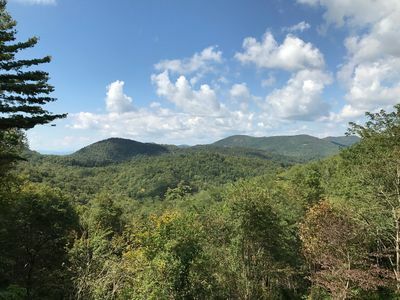 We call this area “The Center of the Universe” and you can go in any direction and find great hiking, waterfalls, amazing motorcycle riding, and quaint little towns for shopping & dining. 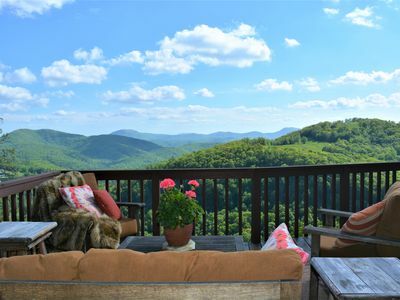 We are thirty miles from Western Carolina University and the towns of Cashiers, Brevard, Sylva, & Dillsboro. 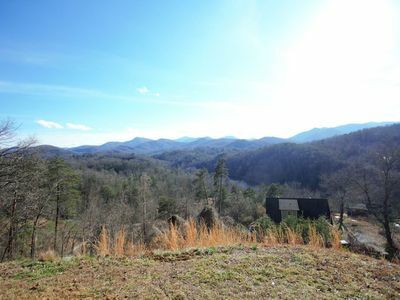 3BR Cullowhee House w/Tranquil Setting! 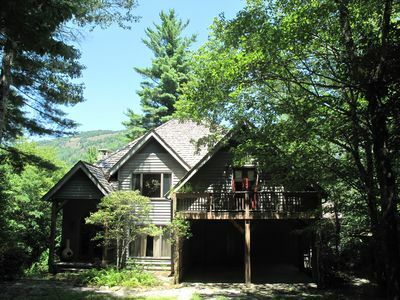 Majestic, Vast Mountain Views, Secluded, and just 15 Minutes from the Lake! 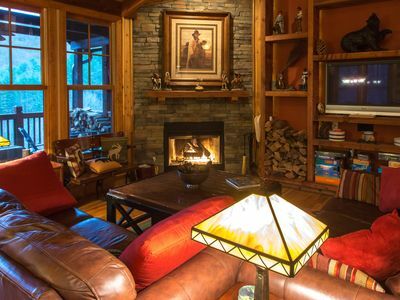 Cozy, PET Friendly Mountain Cottage in Upscale Resort - Access to Lake Club & Golf Course! Luxury Bear Lake Condo - Lake Views, Club Access, Golf, Pools, Dining, Water Sports & More! Artist's home with a beautiful mountain view and convenient location. Catspaw- Mountaintop (4900 ft)- Spectacular Views all Year Long, Cool breezes! Lakefront Fun - Get Away from it All. Internet Now Available!! Charming Cabin with Long Range Views! 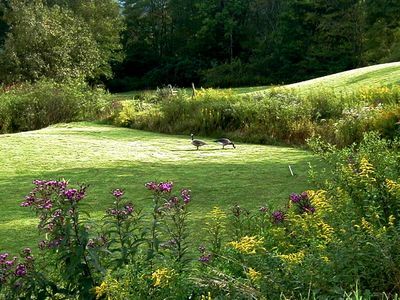 Close to renoun state trout fishing streams!